The next time you’re struggling to hit a personal best or succeeded in any distance – let alone the marathon – remember Kara Waters. [button-red url=”http://www.runwashington.com/2014/04/21/dc-area-boston-finishers/” target=”_self” position=”left”] See all of the D.C. area’s local Boston finishers[/button-red]Waters is a 39-year-old physician, a single mom to four without a coach or running club, and still was able to run a 2:52:29 in Monday’s Boston Marathon. The mark was the top time for a Washington-area female at the 118th running of the race. Hoping to maybe break three hours, she hit the halfway point feeling good, felt the same way at the three-quarter mark, and knew a good time was within reach. She decided to push the last six miles and ended up the 63rd woman overall. In fact, she ran pretty even splits throughout the race, roughly 20 minutes for every five kilometers. The unusually high number of runners in this year’s race — which swelled to 36,000 — probably helped her, she said. Because her corral was more packed than usual, she couldn’t run as aggressively as usual in the first few miles, which helped her at the end of the race. The last several miles of the race carried the same vibrant, up-lifting atmosphere as when the race passes the college campuses of Wellesley and Boston College — people rows and rows deep on both sides of the street. There were numerous events and tributes honoring those who were injured or killed in the bombings last year. Waters felt compelled to call her children multiple times a day before the race just to share her emotions. The overall atmosphere certainly helped her performance, she said. Waters specifically remembered running past an amputee – a presumable survivor, she said – at mile 18, running for Martin Richard, the 8-year-old boy who died last year. “I might have run an okay time, but some of the things these people are doing is amazing,” she said. Somehow, Waters manages to juggle being a single mom to four girls – ages 9, 8, 6, and 5 — with a training schedule necessary to be a top-100 finisher at the country’s most prestigious road race. On top of that, she is also a radiologist in Clinton, Md. She is admittedly not a high-mileage runner and uses “a whole lot of treadmill training” and running solo. She runs at night after she puts the kids to bed or outside on days she doesn’t have them. But that’s her demeanor, humble and thankful. Waters ran track at Colby College in her home state of Maine. She started off in the 400 meters but eventually moved up to running the 5k and 10k by her senior year. She left school as a two-time All-American in cross country and more honors in indoor and outdoor track in the 1500 meters. She ran with the Boston Athletic Association after college before going to medical school at Dartmouth Hitchcock Medical School in New Hampshire. Waters ran her first marathon in Portland, Maine after becoming a doctor and before taking time off to have her four girls. She has slowly started to get more and more back into road racing but admits that she still doesn’t race all that much. Waters only moved closer to the D.C. area about two years ago and is still trying to find her footing in the local racing scene. She used to run with the Howard County Striders when she lived in Ellicott City for more than three years. She recently started to run with the Potomac River Running racing team. 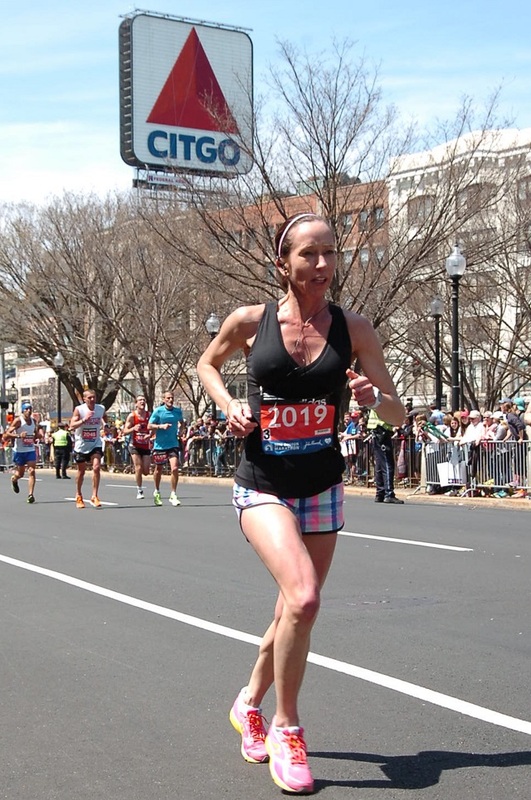 Maybe she can increase her mileage – which was six or seven long runs with some mile repeats thrown in while training for this year’s Boston Marathon – so she can meet running goals like qualifying for the U.S. Olympic trials. This was Waters’ third Boston Marathon. She finished with a 2:58:50 last year and 2:52:05 in 2011 – a mark that’s still a personal best in the distance – when she was the 47th woman overall. Waters would love to at some point in the marathon and qualify for the U.S. Olympic trials in the marathon. But that would require a 2:43:00 for the “B” standard. For now, she has her sights sets on the North Face Endurance Challenge in June and some local 10ks and half marathons later this year. Which ones specifically, she doesn’t yet know. She plans on running the Marine Corps Marathon this fall, where two years ago she clocked a 2:52:32 and placed fifth overall for women. The 2:52 mark in the marathon is something she can’t seem to overcome, hitting it several times in the last few years. It’s the wall she hasn’t been able to knock down. She has still managed to accomplish a great deal for any runners’ standards – let alone a single mother who busy, full-time physician.